We’d love your help. Let us know what’s wrong with this preview of Red Dust and Dancing Horses by Beth Cato. This debut collection from Nebula-nominated author Beth Cato brings together works that span history and space, a showcase of vividly imagined speculative stories that range from introspective and intense to outright whimsical. Here you'll find the souls of horses bonded into war machines of earth and air, toilet gnomes on the rampage, magical pies, a mad scientist mother, This debut collection from Nebula-nominated author Beth Cato brings together works that span history and space, a showcase of vividly imagined speculative stories that range from introspective and intense to outright whimsical. Here you'll find the souls of horses bonded into war machines of earth and air, toilet gnomes on the rampage, magical pies, a mad scientist mother, a bitter old man who rages against giant extraterrestrial robots, and a sentient house that longs to be a home. The book features 28 stories and 6 poems, and includes Cato's acclaimed story "The Souls of Horses." “With Ray Bradbury’s poignant charm, Beth Cato explores the resilience of the soul in this versatile collection of stories." To ask other readers questions about Red Dust and Dancing Horses, please sign up. Beth Cato assembled a real masterpiece of a collection here. The stories are varied and surprising, and Cato is one of those amazing authors who can really deliver on great (and often delightfully strange) concepts. Even with my favorite authors, I often find collections to be uneven; but I can honestly say I enjoyed every one of these tales. Kittens. In. Space. Ok, it sounds silly, but this story has been echoing in my heart ever since I read it. Maybe my favorite? Beth Cato assembled a real masterpiece of a collection here. The stories are varied and surprising, and Cato is one of those amazing authors who can really deliver on great (and often delightfully strange) concepts. Kittens. In. Space. Ok, it sounds silly, but this story has been echoing in my heart ever since I read it. Maybe my favorite? I don't know, I have too many favorites. All of the Apocalypse stories -- I can't resist a glimpse at what the last few people on Earth might be doing at any given moment. Small moments become large ones. These are all fantastic. Am arthritic map maker works in magical ink. Loved this collection. Highly recommend! CW: The Cartography of Shattered Trees deals with assault. With Ray Bradbury's poignant charm, Beth Davis Cato explores the resilience of the soul in this versatile collection of stories. 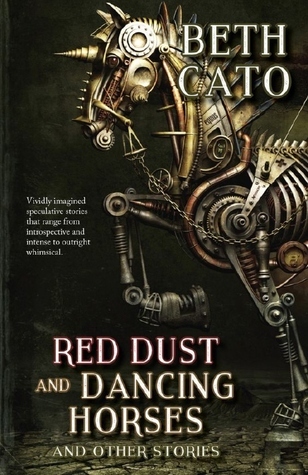 Interspersed with haunting poetry, tales of Steampunk horses, a sole survivor drifting in space, colonies on Mars, and toilet gnomes are just a few of the delights you'll find in Red Dust and Dancing Horses. I received an ARC from Fairwood Press in exchange for an honest review. This is a beautiful and fairly eclectic compliation of short stories. I took my time with one, reading a short story here and there, when I could give it attention, and read the story start to finish. I'm glad I did. Though the stories are speculative fiction by nature, they are diverse and could hit a variety of readers very differently. I thoroughly enjoyed they short story "Red Dust and Dancing Horses"! It evoked the feeli I received an ARC from Fairwood Press in exchange for an honest review. This is a beautiful and fairly eclectic compliation of short stories. I took my time with one, reading a short story here and there, when I could give it attention, and read the story start to finish. I'm glad I did. Though the stories are speculative fiction by nature, they are diverse and could hit a variety of readers very differently. I thoroughly enjoyed they short story "Red Dust and Dancing Horses"! It evoked the feeling of reading The Martian Chronicles for the first time while fusing it with childhood memories of watching Roy Rogers and Trigger in black and white with my Grandfather. I also adored "Toilet Gnomes at War" - it was funny and had gnomes and coffee!! It started out sad but hopeful. All the stories are variations of dystopian societies mostly grim futuristic ones. I got to page 208. The stories became increasingly dismal and disgusting. The last one made me cry. Too many disturbing, depressing stories for me. Loved these si-fi/fantasy/steampunk/apocalyptic stories and poems. Cato is a good writer who made me like things I wasn't sure I would like: Steampunk horses? They were great! Toilet gnomes? What fun! There are even five "Culinary Magic" stories for foodies. One of my favorites in this collection, Roots, Shallow and Deep, is set in Hanford, California during the same period as a novel I've been struggling with for a couple of months -- The Octopus: A Story of California by Frank Norris. This stor Loved these si-fi/fantasy/steampunk/apocalyptic stories and poems. Cato is a good writer who made me like things I wasn't sure I would like: Steampunk horses? They were great! Toilet gnomes? What fun! There are even five "Culinary Magic" stories for foodies. One of my favorites in this collection, Roots, Shallow and Deep, is set in Hanford, California during the same period as a novel I've been struggling with for a couple of months -- The Octopus: A Story of California by Frank Norris. This story encouraged me to pick up the Norris novel again. The amazing cover is by Kuzuhiko Nakamura. Beth Cato's first collection is an exquisite assemblage of work. Broadly thematic (horses, post-apocalypse, ...ummm...pie), her pieces are beautiful jewels of sadness, of heart, of joy, and of the simple truths about being human. Her words are gorgeous, her stories miracles.